TechInAfrica – Due to the bad effect of climate change, many African countries have adopted solar power sources. The new renewable solar power sources are figured as a better solution for drought in the continent. The drought has brought negative effects on African people’s lives, including food scarcity as well as power output decrease. The technology has been adopted in Uganda, Nigeria, as well as Zimbabwe. Currently, the other African countries are also considering following the same path as the countries do. Most of the African countries implement hydro-electric power which has already been dissolutive since it will reduce power output. Therefore, the new power sources appeared to be more preferable as it is economical, reliable, sustainable, efficient, and more importantly, renewable. A small village in Southern Zimbabwe, Mashaba installed a 99Kw grid to support 2 business centers, 2 irrigation schemes, a clinic, as well as a school. The installation seems to bring much more result than the previous power sources. Even more, a farmer claimed that her wheat harvest has increased from 1 ton to 15 tons using the solar energy. Compared to the previous energy source, the current one brings over ten-fold result in her wheat harvest. To learn more about the Mashaba mini-grid, the implementation of solar vaccine refrigerators in Nigeria, the Tororo solar Plant in Uganda, the Entasopia micro-grid in Kenya, and many other stories about solar energy’s impacts in African countries, you can check the ‘Africa Solar Impact Cases Report’. To learn more about the challenges and solutions regarding the development and the funding of solar projects in Africa, you are encouraged to participate in Unlocking Solar Capital (USC) Africa. 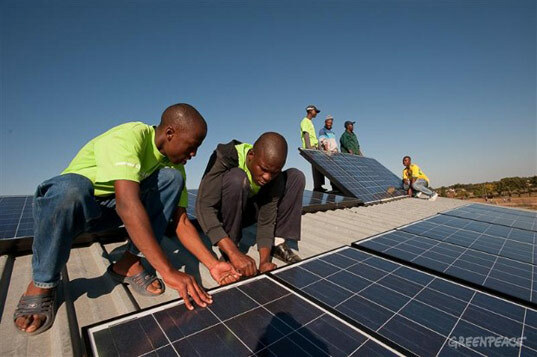 It is the largest conference in Africa regarding new solar development on the continent. The conference will take place for two days in Kigali, Rwanda on November 7-8, 2018. There will be hundreds of solar stakeholders expected to attend the conference, including solar developers, development banks, investment funds, EPCs, IPPs, among many other attendees. Please visit: africa.unlockingsolarcapital.com to find more about the upcoming Unlocking Solar Capital Africa conference.